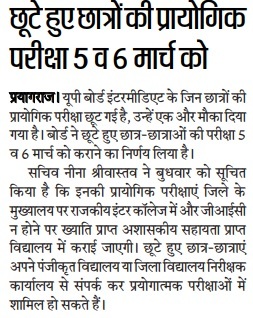 UP Sanskrit Board Exams will conduct from 05 to 15 March, 2019. More than 90000 Students will give exam. Time table will release soon. Read full news from image below..
UPMSP has changed Exam Scheme of 04 Subjects (Maths, Civics, Home Science, Accounts) of Intermediate & Timing of Morning Shift has changed to 08:00 AM to 11:15 AM. 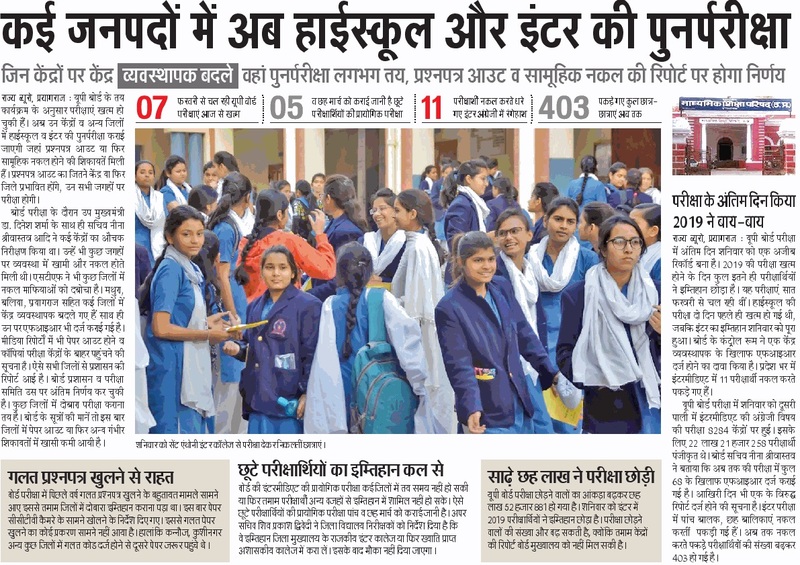 Read full news below…..
UP Board 10th 12th Exam Scheme 2019 has been released Now. UP Board Exams will start from 7 February, 2019 & result will announce on 30 April, 2019. Total 57.87 Lac Candidates has registered for UP Board 10th 12th Exams. 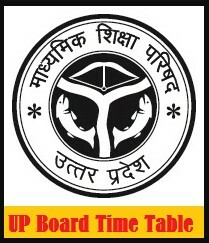 Download UP Board Time Table from Link given below…. माध्यमिक शिक्षा परिषद्, उत्तर प्रदेश, इलाहाबाद हाईस्कूल एवं इण्टरमीडिएट स्तर की परीक्षाओं को संचालित करने वाली विश्व की एक सर्वौच्च संस्था है। (About UPMSP) The Board was set up in the year 1921 at Allahabad by an act of United Provinces Legislative Council. It conducted its first examination in 1923. This Board is one in India which, from the very start, had adopted 10+2 system of examination. The first public examination after 10 years education is High School Examination and after the 10+2 stage, there is Intermediate Examination. Prior to 1923, University of Allahabad was the examining body of these two examinations. ost of the Secondary schools seek recognition of the U.P. Board. At present there are more than 22,000 secondary schools recognized by the U.P. Board of High School and Intermediate Education. 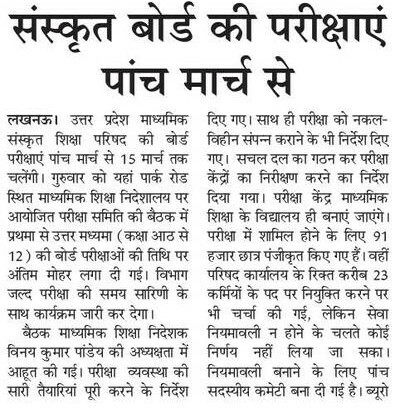 Uttar Pradesh Maadhyamik Shiksha Parishad every year conducts Exams for UP Board High School & Intermediate. Lacs of Students appear in exam every Year. UPMSP announce Date Sheet & Result for UP Board Exams. For Year 2018, UPMSP is fully determined to conduct Exam on Time. Last Year, due to elections exams were delayed. But this Year, Exam may conduct before proposed time. Upto Last Years, UP Board Exam Scheme/ Time Table was announced from Last week of November to December. But this year, maadhyamik education minister has given orders to announce up board time table in the month of October, 2018 so that students can have ample time to prepare for exam. 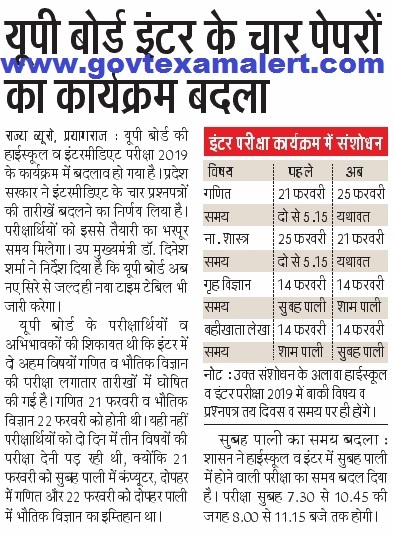 It is expected that UP Board 10th 12th exam may start in February & finish in March, 2019. UPMSP is planning to start New session from April, 2019. Have a look at the Expected UP Board 10th 12th Exam Dates. UPMSP will conduct Practical Exams conduct one month before as compared to last year. 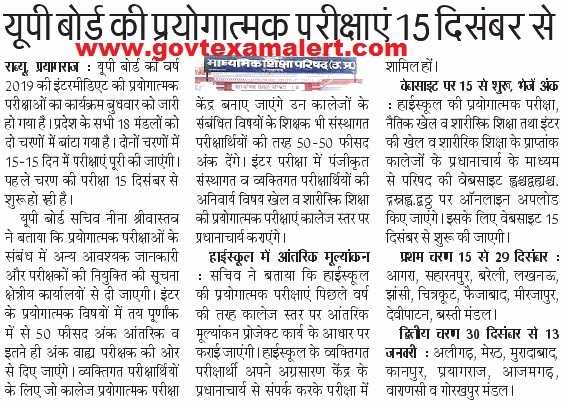 This Year Practical Exams will conduct from 15 December, 2018. This Year Exam Centers also reduce from 12000 to 8000. Check UP Board Practicals Dates of Year 2018 below…..
UP Board Practicals 1st Round : UP Board Practicals 1st Phase may conduct from 15 to 29.12.2018 & It will conduct in Agra, Saharanpur, Bareilly, Lucknow, Jhansi, Chitrakoot, Faizabad, Mirzapur, Devipaatan & Basti Districts. UP Board Practicals 2nd Round : UP Board Practicals 2nd Phase may conduct from 30.12.2018 to 13 January 2019 & It will conduct in Aligarh, Meerit, Moradabad, Kanpur, Allahabad, Azamgarh, Varanasi & Gorakhpur Districts. UP Board 10th 12th Registered Students Details Year 2019 : Massive No. of Students has registered for UP Board Exam 2019. Total 57,87,998 students has registered this Year. Let’s have a look on No. of Registered Applicants for UP Board 10th 12th 2019 Exam. At First Visit Official Website of UP Madhyamik Shiksha Parishad (http://www.upmsp.edu.in/). On Home Page, You will find link to Download UP Board Time Table 2019. On that Page, there will be separate links of 10th & 12th Date Sheet 2019. Separate pdf files will open. Students can save those pdf Files & Take Print out of UP Board Time Table for 10th & 12th Class Exam 2019. UP Board Students need to have quick & regular watch on UPMSP Official Website regarding UP Board Time Table 2018-2019. Detailed Information & Updates will also available on www.govtexamalert.com itself. Students can also leave their queries at disha@govtexamalert.com. Aspirants having queries related to UP Board Time Table 2019 for High School & Intermediate can comment us through the comment box. We will try to solve your queries. 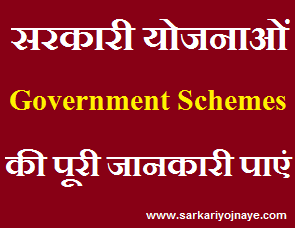 download scheme from this link..
2019 ka sahi scheme kahan dekhun? Hi Abhishek, Download Exam scheme from given link..